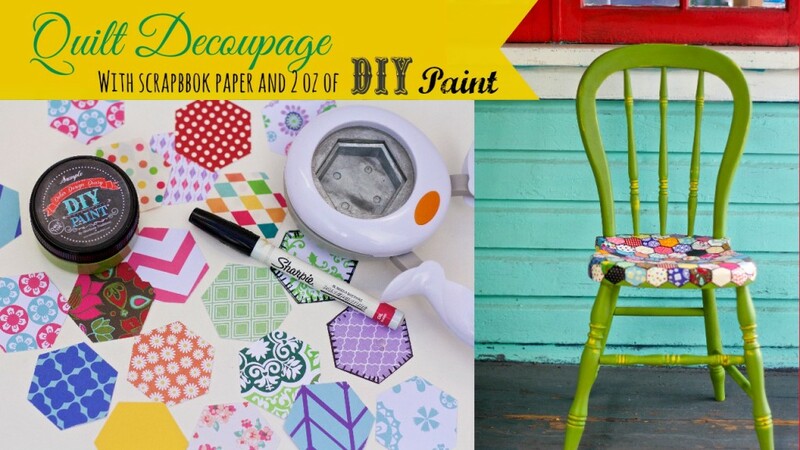 How to Decoupage furniture to loo like a quilt with scrapbook paper also, I painted this chair with 2 ounces of DIY Paint! Here’s a list of products used to make this projects and links to purchase. Scrapbook paper assortment i used what I had in my stash but this link will take you to some that looks like vintage fabric prints. Clear patina, this amazing product is a fantastic decoupage medium, a top coat, a sealer, a glazing gel and a transfer gel in one! I filmed an entirely different project last week, but it didn’t turn out as awesome as I had imagined, so I scrapped it and went to work on this chair. I haven’t given up on the other project/problem child we’re going to film it again… it’s going to be good…. eventually! I’m thankful that this idea worked well without too many hiccups and ended up like what I had pictured inside my head. Often it’s a slow progression of trip and error until it looks the way i’d hoped. 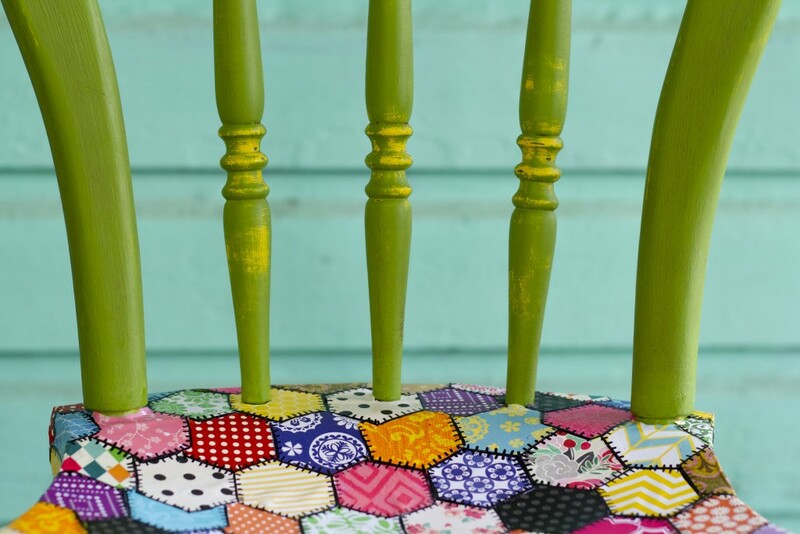 This little chair was fairly simple to make and a great project for the little bits and pieces of scrap paper you may laying around your craft room! I have a hard time throwing out little bits of pretty things, it’s the other side of seeing potential where others see trash. I have baggies full of paper bits they have sat in a drawer for years along with many other random pieces that I can’t toss. 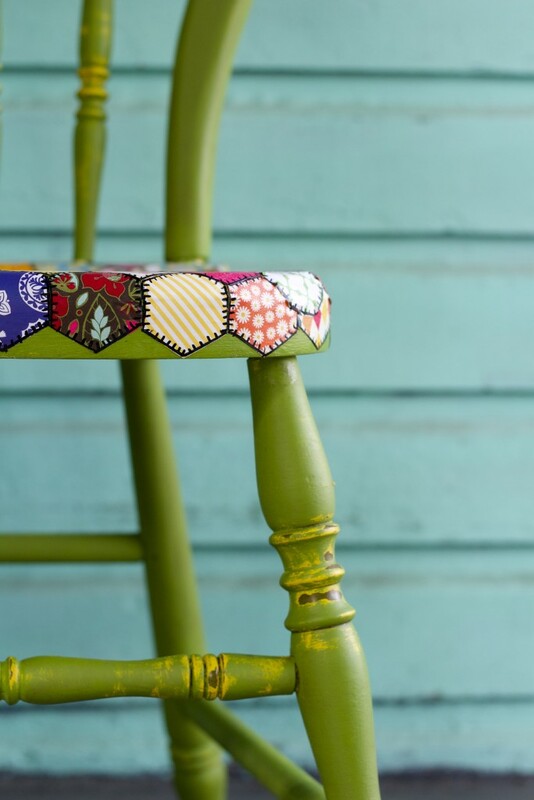 I was happy to use some of the hoarded stash, however once I got going I realized that I didn’t have any yellow paper… and this chair would be so much better with a little bit of yellow. I stopped work drove to the craft store and ended up purchasing about 20 more sheets of scrapbook paper to add to my drawer that is already filled. Is there a craft hoaxers support group I can join? 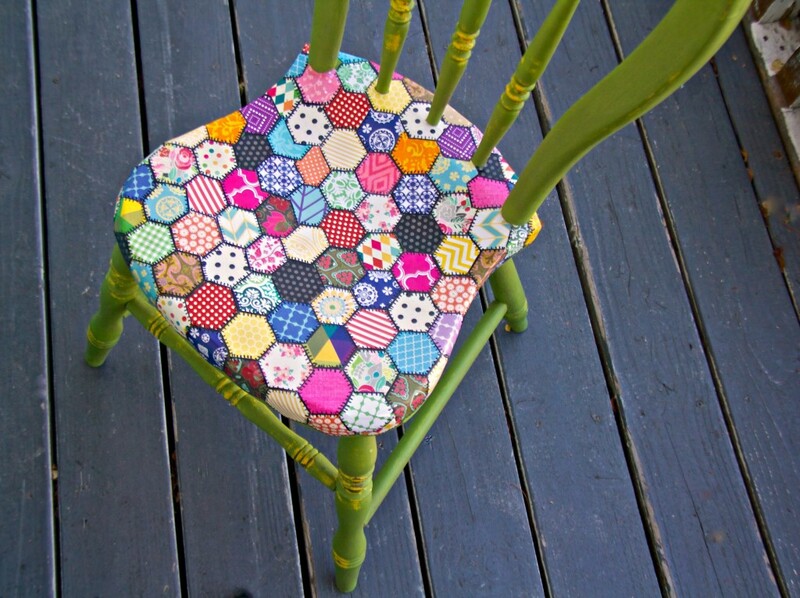 The chair was a 5$ yard sale gem, I loved the shape of this sweet chair so much that I started work on it right away. I’m also excited to share how to rub the paint back with a damp cloth, this is so much easier than using sand paper, see the yellow (Queen Bee) peeking through. It’s great for detailed areas and seems to look more authentic, as paint in many cases will rub away, instead of scratch off. 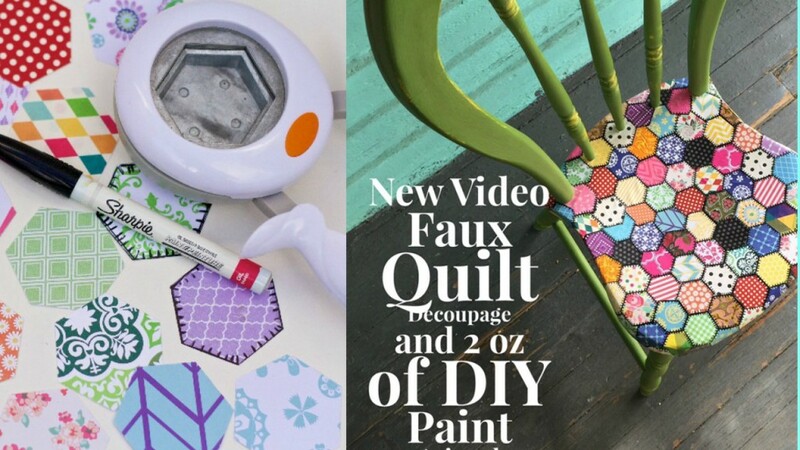 DIY Paint is highly pigmented I was curious to see exactly how far just 2 ounces of Fancy Farm Girl would go… pictured below is a 32 ounce quart … it’s very possible you could paint 16 chairs with this! All totaled 2 ounces of Fancy Farm girl and two ounces of Queen bee =’s about $4 in paint. 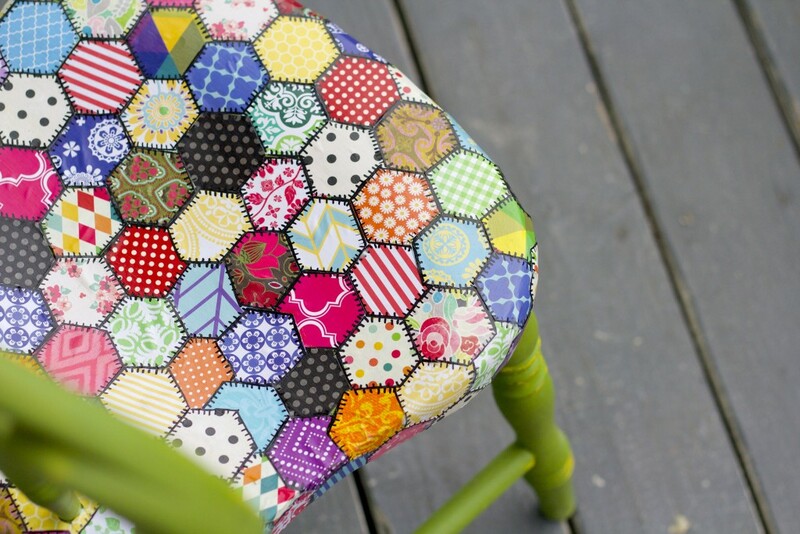 See how I covered the entire chair including the seat hiding under the scrapbook paper with 2 ounces of each color. I post new videos weekly, if you want to be notified each time a new one is up subscribe here. Next I would like to try a table next and attempt a wedding ring pattern, this chair was curved so I needed to over lap the paper, this prevented me from creating a repeating design howevert a flat surface would allow more options. This is one of our newest colors, this pretty table was 20$ at my local thrift shop + three ounces of DIY paint and some liquid patina. 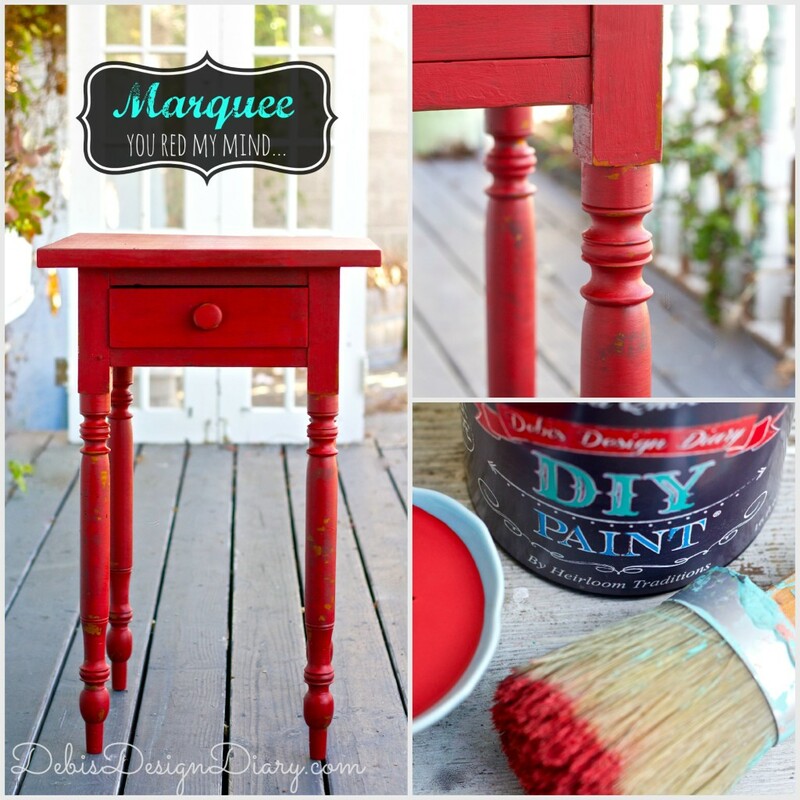 I’ll be linking up at Miss Mustard Seed’s Furniture party this week! 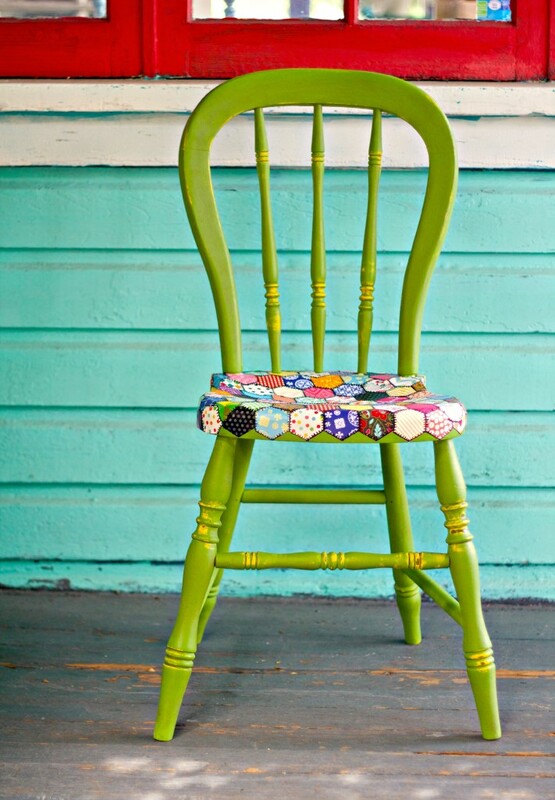 Love the chair.!! So darn cute ♥ How do you keep the mod podged paper from peeling up off the wood? 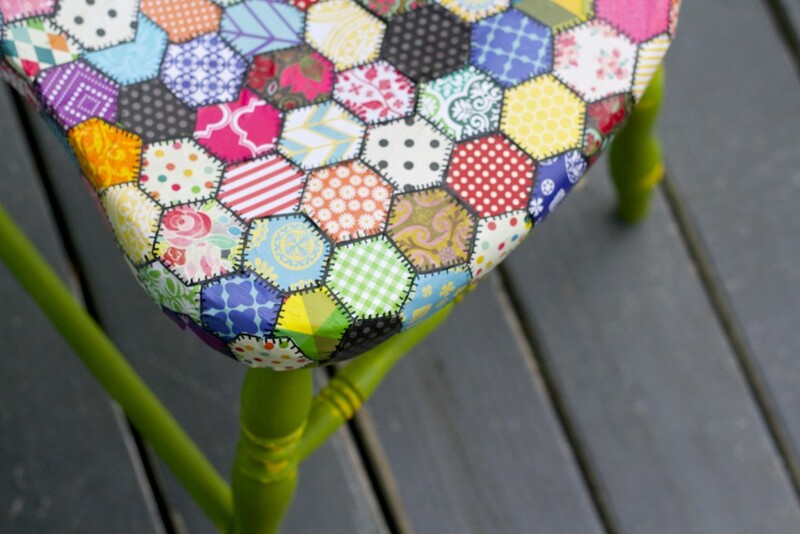 I did a small stool once, and the mod podged paper peeled off in one sheet. Am wondering if I did something wrong in the prep? Maybe I should have sanded before putting on the paper? Debi, I wish I lived closer to you, would love to stop by and see all your fun creations. I am thrilled that you started your own line of paints and would like to buy them from YOU from now on. 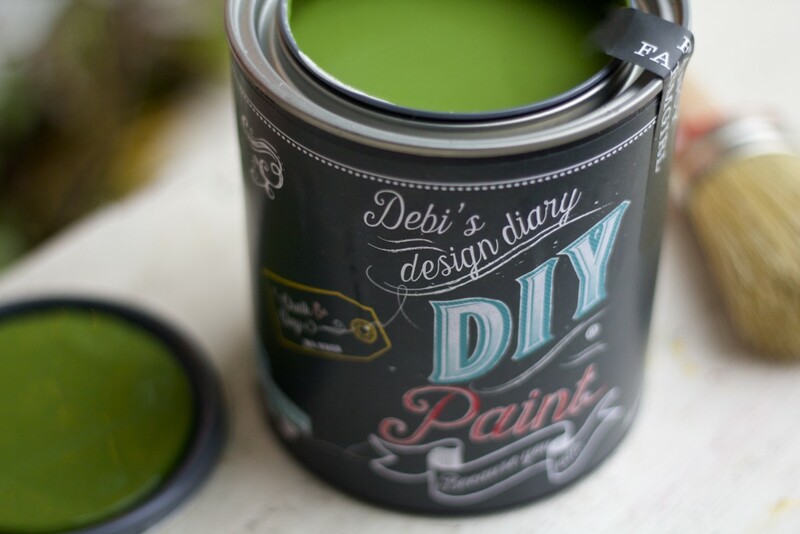 I am assuming they are applied the same as all the other chalk paints, right? If your ever looking to visit the East Coast ( New Jersey ) shoot me a message. The Jersey Shore is nothing like is nothing like it is portrayed to be……. It’s beautiful here!!!!!!! Thank you for all of you inspiring ideas. Debi, I love your videos and am always inspired after I watch them! I’m wondering how your new paint distresses as compared to CC’s? The thing I love about CC’s, is the fact that I can distress with a cloth or baby wipe. With other chalk paints that I’ve tried, I have to use sanding paper, so how does your paint compare? Also, if I want a layer of different colors, should I seal each color, before I add the next one? Keep up the great work! Thanks and God Bless! I have the perfect chair for this, and oodles of scrap paper. I just completed my chair and I love it! Thanks for inspiring me!